← Does Income Inequality Cause Poor Health? Whenever research questions are embroiled in personal debates about the way to live a good life, then you know that you’re about to witness a scrap. 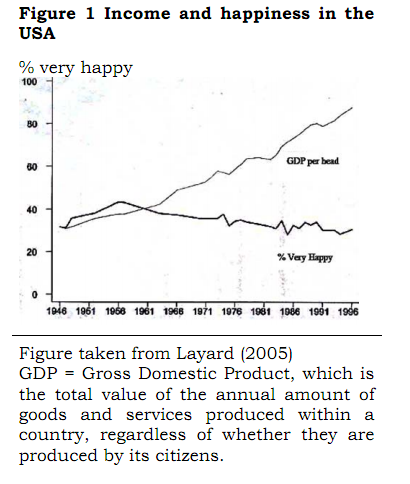 And if that wasn’t enough for a robust fight, then the money-happiness link speaks to grander questions about whether we should give up on our chase of GDP growth and replace it with the pursuit of happiness (not quite the point David Cameron was recently making, but the same audience he was appealing to). But personal and political dogmas aside, does money really have no effect on happiness – obviously beyond the point at which material needs are satisfied? Rich countries are happier than poor countries, both currently and in the recent past. However, the effect of average income is only constant on a log scale – that is, a 10% rise in average income has a constant effect on happiness, which means $1000 has a much greater effect on happiness in poor countries than in rich countries. (They flag Angus Deaton’s work here). On a normal scale it looks like the effect of income disappears in rich countries, but on a log scale you get a surprisingly nice straight line. This is all by way of a long prelude to a study by Kahneman and Deaton in PNAS. To the extent that I’d thought about it, I’d always assumed that happiness was a reasonably coherent thing – that is, if money buys happiness of one sort, it buys happiness of other sorts as well. What K&D show, however, is that this is not the case. (Stevenson and Wolfers briefly touch on this in their paper/final Freakonomics post, but fundamentally their analyses are primarily about reported life satisfaction). 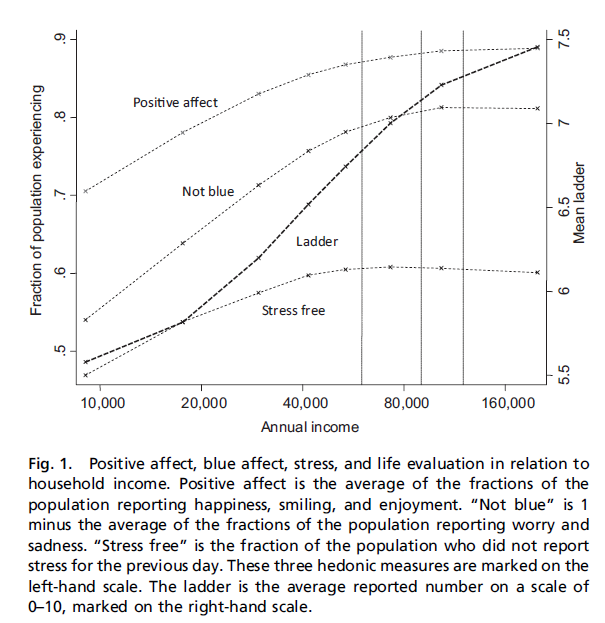 The clearest demonstration of this is the following chart, which looks at the relationship of income (on a log scale) and four measures of happiness – ‘positive affect’ (the average of yes/no responses on happiness, enjoyment, and frequent smiling/laughter), ‘blue affect’ (the average of worry and sadness), reported stress, and life satisfaction (using the Cantril ladder). A further interesting point in K&D is that some risk factors for sadness & worry have greater effects in poorer people than others. For example, in unadjusted analyses, having a headache the previous day leads to 20% (percentage points) more worry in richer people, but 32% more worry in poorer people. This leads us to think about why money matters, in both reducing the chances of bad events happening, and helping us to cope with those events when they do happen. There’s all sorts of further checks needed on these results (to do with floor/ceiling effects, question interpretation in different income groups, international comparisons and the like). But if this is true, then we need to think very carefully about exactly what type of happiness/wellbeing we’re most interested in. Stevenson and Wolfers seem to be right that economic growth leads to life satisfaction – but if growth has a weaker relationship with our daily emotional experiences, then perhaps life satisfaction isn’t as important as we think it is. All of which reminds me of a fabulous series of lectures by financial regulator and substantial thinker Adair Turner at the LSE last year, on the relationship of growth to wellbeing – I hope to blog about these in future, but if I don’t get a chance to, then the first and third lectures are perhaps the most interesting talks I’ve heard in the last couple of years. This entry was posted in Articles and tagged cross-national research, happiness, psychology. Bookmark the permalink. 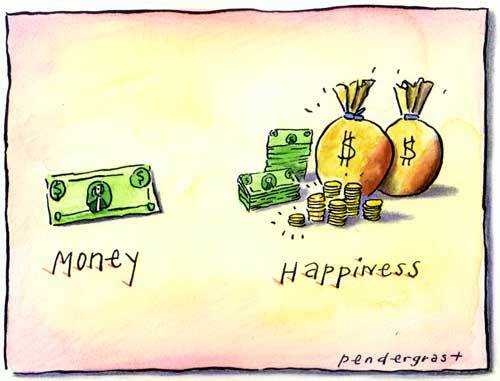 9 Responses to Does money buy happiness? This totally knocks my socks off! I learned a ton from this post and I have so many questions. Any sense of what the variance is within income groups? Is it constant across groups? It would also be interesting to see whether the variation across income groups is much greater than across other social cleavages such as ethnicity, religion, urban/rural, and education — particularly with the latter I’ve wondered about whether education is a tool that, independent of its ability to produce money, also allows one to more reliably produce happiness. A thought: It would be very interesting to look at the whether the happiness curves and the Preston curve over time for the health-income relationship vary in the same way (the Preston curve also increases monotonically at every cross-section, but at a decreasing rate, the Preston curve shifts in levels between earlier and later time periods). Anyway, kudos, this was great! – The question on variability in happiness is really interesting – Stevenson & Wolfers have another paper that looks at exactly that, through the lens of ‘happiness inequality’. They find that average happiness hasn’t changed much, but inequality in happiness has fallen substantially in the US (particularly in the 70s and early 80s). – Education, ethnicity and happiness are also covered in that Stevenson & Wolfers paper, but I don’t think controlling for one another. I don’t know if education has an independent effect, but this paper sounds like it investigates it (I’ve not had a chance to read through it in detail). There’s a bunch of papers looking at predictors of happiness, though, so I’m sure it’s possible to find out. My impression from glancing over the literature out of interest is that religion is really important. Conservatives are also happier than liberals, as nicely discussed in yet another Freakonomics post! This whole area is really interesting anyway – you can say why so many people are working on it these days! Ben’s post throws up some great stuff, and I can’t pretend to understand all of it. But I’ll make one point. There’s a danger in social policy (I nearly said “on the Left”!) to think of money itself and not what it represents. Money is the intermediary between our giving real resources (my time at work last month, the stuff I sold on eBay) and acquiring real resources (tenancy in my flat this coming month, a coffee in Starbucks). We talk about money in “real terms” to account for its declining value. But we should apply the phrase to the underlying. It’s not just about how many Mars bars I can buy for a fiver. It is rather, 1) How easily can I acquire the skills others want? 2) how quickly and easily can I trade time using those skills for that picture of Elizabeth Fry, and 3) what choices does that £5 give me in housing, my kids’ education, seeing my family etc. When a commuter train fails and its passengers get angry, there’s a sudden gap-change: trading what we can offer for the life we want became harder instantaneously. A trivial event, but it’s a kind of inflation. Our day to day lives must be seen in “real terms”. That Layard graph would be much harder to plot if it didn’t mention money; just our skills, hopes for the future, and the ease of exchange between them. But if those qualitative and highly disparate things could be measured, I think you’d have a pretty good proxy for happiness. That idea should be common ground. The battle between Left and Right (and Ben knows I see everything this way!) is this: when is it justified and how is it most effective for the State to interfere in the market to help us exchange what they let us keep for the life want? Some will say it’s not worth having more money if public services collapse. Others feel the extra surplus they made through GDP growth hasn’t kept pace with the house price boom. Personally I’d cheer up if my country could topple foreign despots without having egg on its face the next week when it all unravels. I’d gladly trade some surplus I make as a software guy to live in a proper country with proper guns. Pingback: Are you making “enough”? Pingback: So I hear you want a Job | the college PR life.